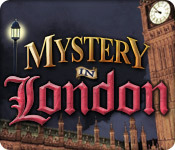 Mystery in London ™ is rated 3.9 out of 5 by 27. Rated 5 out of 5 by Charlssteyn25 from Absolutely love this game it addictive and a must buy. Will never get bored with this game, entertainment from start to finish. Rated 5 out of 5 by joeltb from Probably one of my all time favorite games! This game is amazingly fun to play. Neat take on an hidden object game. I don't really care for the hidden object games that have cartoon-like graphics(most do). This game has pretty realistic and at times, HDR looking graphics. Fun game, although it does not appear to work on OS X Yosemite or OS X El Capitan. Rated 5 out of 5 by FinkJesse1992 from LOVE IT I am addicted to this game! The Scenery, the music, the puzzles...EVERYTHING! Its just amazing and it never fails to excite. Its an amazing game with challenges everywhere but challenges that are fun and do not get boring. Its also excellent value for money! Rated 5 out of 5 by mintjulelip from Bring these back! This was one of the first games I purchased on BFG. I absolutely love the 360 ability of these games. HOG's have evolved and graphics are so much better now so it would be stunning to have a new generation HOG with 360 capabilities. This is one of the few games I've played over and over. It really does give me a sense of London. I wasn't a big fan of the Paris or Rome games but this game is timeless. Please, BGH devs, bring out a new 360! Rated 5 out of 5 by glenan from BEST GRAPHICS EVER! I love this game, along with Rome: Mystery of the Necklace, and Paris: 360 Degrees. All three share a unique style of game play, the 360 degree type of scene motion that is vertical as well as horizontal, with amazing 3D photo-realistic graphics. MOST VALUABLE TO ME AND OTHERS OVER 45: This kind of game permits zooming in for a closer look, which allows those who are visually challenged to continue to play. I also like that this game has so many scenes that you could replay it after only a brief interval and it would be fun again. I wish more of these games were available. Rated 5 out of 5 by gamefan10 from LOVED this game! There's something very engaging about trying to find objects using a 360 degree roller. Imagine some of the most iconic sights of London, filled with mysterious objects, and it's your job to find them. Part of the game is finding the objects, and the other part is trying to solve the mystery of the true identity of Jack the Ripper. Clues are all over the place, and you have to finish the game to see if the mystery is ever solved. 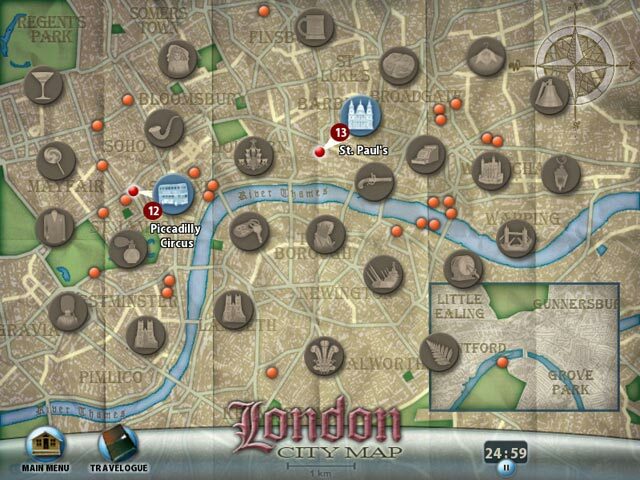 This game should really be called Travelogue 360: Mystery in London. It's the third and best game in the series. The first game is Travelogue 360: Paris and the second game is Rome: Curse of the Necklace. Both are fun games. This game, however, has all the wrinkles ironed out. The roller ball is very smooth (not so in the other games). There are unlimited hints just in case you can't find one or two objects. Some of the scenes have silhouettes of objects rather than a list. Other scenes have objects that are moving slightly, which you have to find. This game was lots of fun to play! I highly recommend it. Rated 5 out of 5 by Boomer1097 from The Hunt is On I really enjoyed this game! You play as a tourist in London and stumble into solving one of the greatest mysteries while you are sight seeing. There are a number of locations to visit around London. Each location has 360 degree views, which I really enjoyed. The game is primarily HOS, but they are some variations such as find moving objects, find foods, find animals, etc. The mini games are not too numerous, but are fun. You visit most locations more than once. The game is broken into 19 chapters. You have a map and journal, both of which come in handy. You meet several characters along the way. You also get interesting fun facts/historical info at each location, which was quite entertaining. The cut scenes and voice overs are well done, the graphics are great, the music is appropriate and not annoying. This game had me yearning to grab the passport and call the airlines. It's been too long since I've been to London. For those players that enjoy HOS and want a slower paced game, this is an excellent choice! Rated 5 out of 5 by shellian731 from If you like it, you'll love it. I got this game quite a while ago and didn't really get into it at first. When I actually spent a little time getting used to the technical aspects of navigating the hidden object rooms, it was fun, challenging and lengthy. Best: excellent clear graphics, challenging hidden object scenes, plenty of hints. Not So Great: navigation tools difficult to master at first, plot not very interesting. This game has TWENTY chapters. 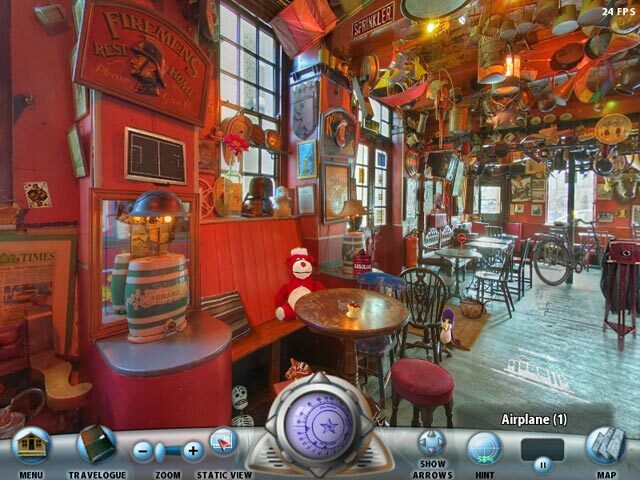 You go back to various scenes many times, with different hidden object challenges each time. But as you go, finding things gets easier. If you enjoy this game, you will be very happy because it seems endless. 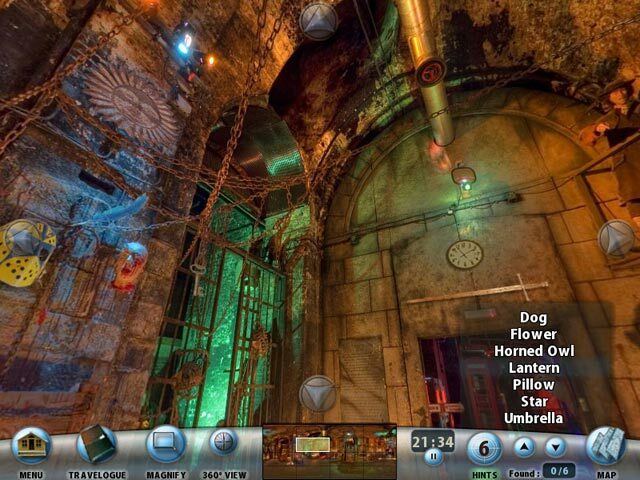 The mini-games between the hidden object scenes test a variety of mental skills. But if you find them boring you can easily skip them. This is most of all a hidden object game. This game does visit the "London Dungeon" which has a few very mildly gory images, but otherwise it's not gross or scary. Try this game. You'll probably know pretty quickly if you will like it, and if you like it, you'll love it. Rated 5 out of 5 by coolang1989 from LOVED THIS GAME What can i say. I loved this game. This is a virtual 360 HO game with good graphics and good sound quality. I loved traveling around London and sightseeing. I loved the music. It fit the description of the game. they offer a magnifing glass to search all of the small objects so that they are easy to see:) I definatly recommend this game. the mini games were fun to that included some word search games. Rated 5 out of 5 by lahdeeda from Excellent Game! It's a lot of fun, an incredible challenge (with hints so you don't go entirely crazy) and a new spin on an old story. The only thing that I would definitely say is DO NOT PLAY THIS GAME IF YOU ARE A BEGINNER! It's awesome, but if you start out here, you'll be too frustrated to go on. Explore the city of London through 360-degree photographs and investigate it`s notorious past in this great Hidden Object mystery.